The complete organic diet happens to be a healthy choice and that is the reason why the elderlies in every family always insist on the organic diet. Unlike the conventional or modern methods of farming, previously there did not exist the use of synthetic fertilizers, Genetically Modified Organisms (GMOs), pesticides, synthetic fertilizers and herbicides. You should not expect optimal health by having foods rich in toxic chemicals that are alien to the body. The organic foods are much fresher and taste much better and that is why they should be the ones that you should have. Apples being one of the most beneficial fruits should be a regular inclusion in your diet and the organic apples are the best choice for the betterment of health that will help you thrive. So why settle for anything less? 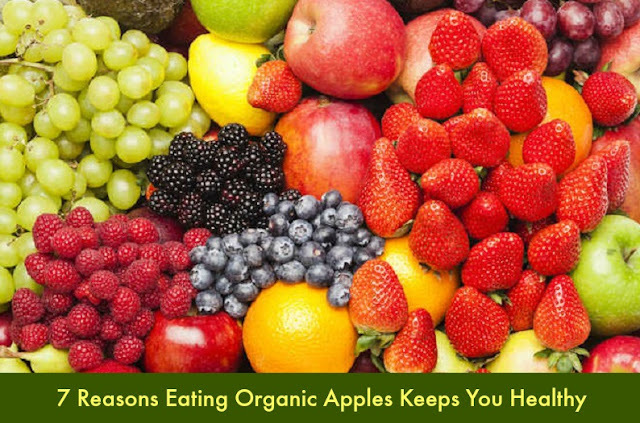 Here are some of the reasons why having organic apples keep you healthy! More pesticides are detected on apples that are conventionally grown as compared to any other fruits and veggies. Research has revealed that the number goes upto almost 36! In one study there are almost seven chemicals detected on a particular apple which is bound to have serious adverse effects on anyone’s health when consumed. An apple a day keeps the doctor away – this is one saying that you may have heard a lot and research reveals that it is all correct. Apples are recently added to the list of the superfoods that combat Cancer. A high level of fibres and Vitamin C that protect your body against any kind of ailment including cancer are also found in apples. They also consist of the antioxidants like triterpenoids and quercetin that can slow down the growth of cancer cells. The animals and the plants that are termed “organic” are devoid of herbicides, pesticides, ionizing radiation, fertilizers from sewage sludge or synthetic ingredients, antibiotics and growth hormone. Fortunately, the organic apples reduce the build-up of the pesticides. So if you are into the conventional diet for years you should cleanse the toxic residues of the body by regularly going for organic apples which help to detoxify your livers to a great extent and also constitute in most of the detox and cleansing products available today. The apples can enhance your memory and reduce the risks of Alzheimer’s to a great extent. This mainly happens because of the production of acetylcholine. You should have juice of organic apples in order derive the benefits of acetylcholine to the fullest. As said above, the quercetin is a type of antioxidant that is found in red organic apples in ample amounts. This antioxidant quercetin is responsible for boosting and fortifying immune system. Consuming the healthy amounts of organic apples on a regular basis helps to regulate the acid content of the body. Thus, by having apples you can resist against diseases better and enhance the physical strength. The pesticides used in conventional apples also have a great impact on the environment and the wildlife get harmed by it directly or indirectly. They become sick and can even die when they are exposed to chemicals of this sort. So as a responsible consumer and citizen, not only organic apples but even sticking to entirely organic diet is ideal and most coveted. A great way to whiten your pearly whites without any side-effects is to have more organic apples. By enacting as a scrubbing brush, organic apples help to remove stains and bacteria from the teeth. Malic acid which is an active ingredient in most teeth whiteners is also contained in apples. So, to keep your teeth healthy and happy eat at least one apple every day. Even the experienced dentists of the reputed and the best dental clinic in Hyderabad recommend organic apples for a great oral health that should be part of your regular diet. So, if you want to retain your pearly whites and stay healthy apples should be your favorite edible companion.